The administrative office of the Jonesboro Police Department includes the Office of the Chief of Police, which also includes the Assistant Chief of Police, an Administrative Captain, Public Information Officer, Community Outreach and Recruiting Officer and the Chief’s Administrative Assistant. The Administrative Services Captain also oversees the Support Services units of the department, as well as Professional Standards (Internal Affairs) and Accreditation. Some of the support units include Animal Control and the Records Division. While some of these units are overseen by and include certified law enforcement officers, many are civilian employees. Administrative services also provides daily support for the Chief of Police and the rest of the department with services such as planning and research, fiscal affairs, crime analysis, alarm tracking, records maintenance, and supply and fleet operations. The Jonesboro Police Department believes the public has a right to expect efficient, fair and impartial law enforcement from officers. Occasionally, citizens may have an interaction with an officer that lowers the esteem of the entire department in their eyes. For such occurrences, we have a mechanism in place for citizens to file complaints. An officer compliment or complaint may be filed any time, click here to find out more about this process. The Animal Control Department investigates all reports of animal cruelty, animal attacks, and bite reports. At our animal shelter we care for stray, abused, and surrendered animals. By working both here at home and with animal rescue operations across the country, we find new homes for most of the animals we take in. By enforcing animal-related laws and educating the public about animal care and welfare issues, we protect both the health and safety of humans and animals alike. We are here to assist with any animal-related problems you may have. The Jonesboro Police Department K-9 Unit is made up of seven teams and is supervised by Sgt. Larry Rogers. Each team consists of a handler and K-9. Six of the teams are trained in narcotics detection and patrol work, to include aggression and tracking and are responsible for assisting patrol units when requested. We also have one team trained in explosives detection and patrol work. Each team must participate in at least sixteen hours of formal training per month and are certified on a yearly basis. The Jonesboro Police Department believes in building a strong relationship with the community we serve. Our officers are involved in many community outreach events through the department as well as with professional organizations. Some of those events include Shop With a Cop, Special Olympics, Law Enforcement Torch Run, National Night Out and Citizen Police Academy. Our officers have also worked with United Way, Make-a-Wish, John 3:16, local churches and schools, neighborhood groups and many other organizations. Visit our Community Outreach Page to learn more about these initiatives. The Crime Analysis division is responsible for the analysis and dissemination of crime activity data and the collection and maintenance of crime intelligence information for the city of Jonesboro. The information they provide contributes to officer safety and crime reduction efforts. 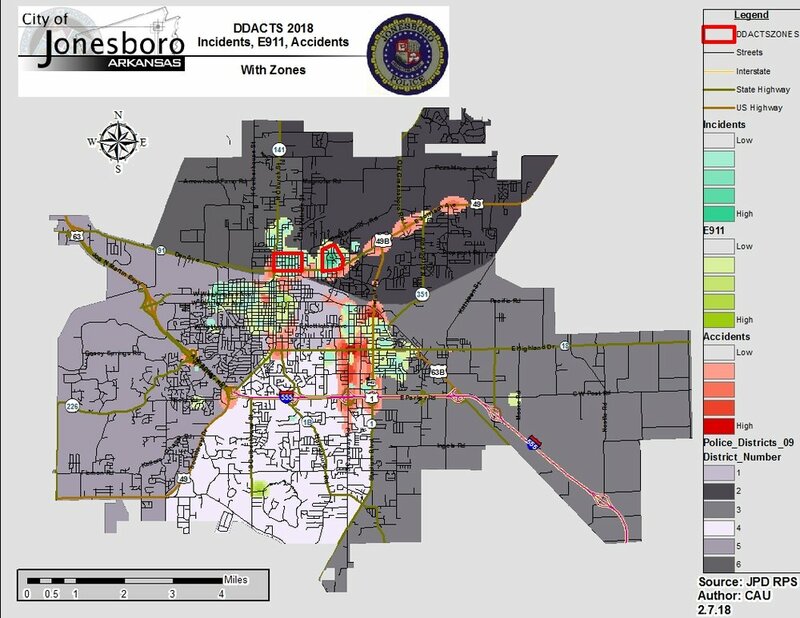 Additionally, the Crime Analyst provides the Jonesboro Police Department with current and accurate crime maps presenting crime activity data to audiences of interest. The Crime Analysis Unit is also charged with responding to requests for crime data from civilians and departmental staff. Data exported from this division is used by field agents for more effective, efficient policing; by administration for improved staffing decisions; and by the Mayor’s office for community decision making and enhanced public relations. The Records Division of the Jonesboro Police Department is a support unit comprised of four full and part time employees who provide general record maintenance and data entry for the department. Visit the Obtain a Report page to learn about how you can request records, or fill out the form on the File a Report page to file a Police Report with JPD. The Service Division of the Jonesboro Police Department is responsible for the complete process of researching, purchasing, distributing, maintaining, and inventorying police department vehicles, uniforms, and equipment necessary to provide service to the citizens of Jonesboro. With the help of two full-time ASE certified mechanics that are on staff, the equipment, maintenance, and repair needs of several types of fleet and specialized police vehicles are also met. JPD Fleet vehicles include various makes and models of patrol cars, trucks, SUVs, and motorcycles. Approaching 30 years with the Jonesboro Police Department, Captain Scott Baxter is experienced in Patrol, CID, Evidence, Crime Scene Processing, Service Division, SWAT, & Honor Guard. He is a graduate of the FBI National Academy and has achieved the Law Enforcement Senior Certificate with the Commission on Law Enforcement Standards & Training. He has served on the Criminal Justice Institute Advisory Board, the Commission of Law Enforcement Standards and Training, and is an active police Trustee on the AR LOPFI Retirement Board.